Unsurprisingly, Square-Enix's Final Fantasy XIII has been a huge hit in its native Japan, selling 1.5 million copies in its first week - and putting the game in the hands of one-third of all Japanese PS3 owners. If there was anyone in our audience who was honestly not expecting Final Fantasy XIII to do well, raise your hand. Now lower your hand and (with said hand) slap yourself across the face for being a ninny. As the first proper Final Fantasy in almost 5 years, the game was unsurprisingly an instant hit (one might even say, a lightning hit) when it launched last week in Japan, and uber-game-mag Famitsu confirmed a weekly sales figure of 1,516,532 units for the game's launch. That's a respectable number, to be sure - but it's even more respectable when you figure that this was for the week ending on December 20th, and FF13 came out on the 17th - so that isn't even a full week of sales, and in the smaller Japanese market no less. But that isn't even the most impressive number here: Another Famitsu report claims that Final Fantasy XIII caused a spike in PS3 sales, with the console moving 250,000 units in concert with the game's launch (that's more than the spike that accompanied the release of the PS3 Slim, by the way). Given that Sony announced that the PS3 had topped 4 million consoles sold in Japan just last week, let's assume that all of these PS3s are in the hands of unique individuals and that there's a total install base of 4,250,000 Japanese PS3 owners. Some quick math gives us a Final Fantasy XIII attach rate of 35%. 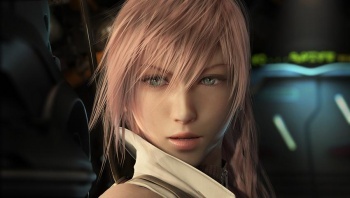 In other words, a third of all Japanese PS3 owners bought Final Fantasy XIII in less than a week. That's a staggering attach rate, and one that most games would be incredibly lucky to ever achieve. To be fair, the game is unlikely to sell that many more copies after its first week, as new software (that isn't on the Wii) almost always faces a precipitous drop-off, but that's still a very, very strong performance from Square-Enix. Talk about Greased Lightning, huh?